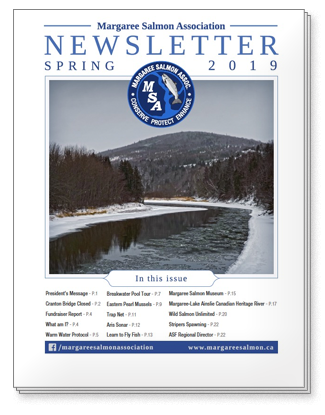 The Margaree Salmon Association publishes a digital newsletter every spring and fall. Click here to view MSA’s Spring 2018 Newsletter! Click here to view MSA’s Fall 2017 Newsletter! Click here to view MSA’s Spring 2017 Newsletter! Click here to view MSA’s Fall 2016 Newsletter! Special Digital Edition for 2016: A digital version of the newsletter is available for online viewing, click here to access this special edition. Special Digital Edition for 2015: A digital version of the newsletter is available for online viewing, click here to access this special edition. Members, if you wish to receive the MSA newsletter by e-mail, please send us your e-mail address so we can add you to our mailing list!